Meanwhile, in 5-quart Dutch oven, melt butter over medium-high heat. Cook mushrooms in butter 7 to 8 minutes, stirring frequently, until softened and liquid is evaporated. Add garlic; cook 30 seconds. Add whipping cream; cook and stir 3 to 4 minutes or until slightly thickened. Stir in Alfredo sauce. Add zucchini, asparagus and pepper flakes. Cook 3 minutes, stirring frequently. Add shrimp. 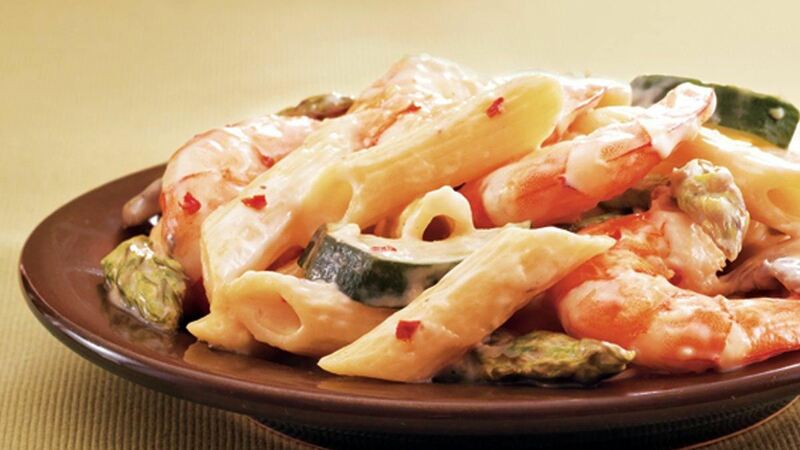 Cook and stir 1 minute or until asparagus is crisp-tender and shrimp are thoroughly heated. Add cooked pasta to shrimp mixture; toss to combine. Season with salt.